No matter what your views on marine parks, it is important that you know as much about the lives of the animals there as possible. Otherwise, you can’t really hold whatever views you have honestly. A few days ago, a picture came across my desk, and Elizabeth Batt has written up the backstory over at Digital Journal. I hesitated to publish the picture because it is dramatic and open to mis-interpretation. But the more I thought about it, the more I felt that not publishing it also is a dis-service, and also dishonest. And that you can never know or understand more by NOT seeing something. So below is the picture that got Elizabeth going on her article. 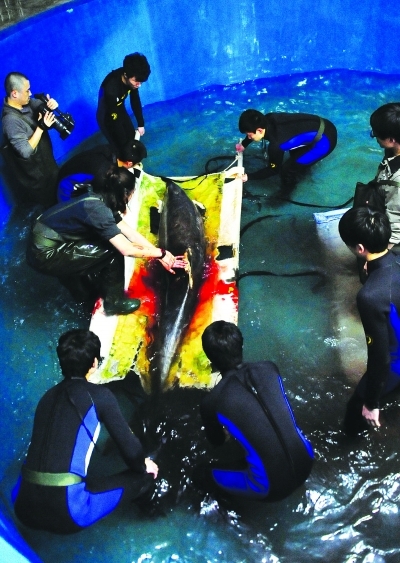 It shows a team at an Asian marine park trying to save a dolphin’s life by amputating an infected dorsal. One one level it is hard to object to what they are doing, as brutal as the procedure might be for an animal that can’t handle general anesthetic. But the picture also shows the sort of lives and experience marine mammals at marine parks live, in contrast to the lives they live in their natural environment. If this dolphin came from the Taiji drives, as seems likely from Elizabeth’s reporting, you can say that it is “lucky” to be alive, and you would be right in the sense that getting sold to a marine park is possibly better than being slaughtered in a cove (though who really knows which of those two fates a dolphin would choose it if could choose between those two fates). But that doesn’t take away from the truth of what the picture shows about the alien (to a marine mammal) world of marine mammal captivity (plus, it is the sale of dolphins to marine parks that underlies much of the economic incentive for the Taiji drives, so there is a bigger picture). Finally, yes, the ocean can be a tough place, and dolphins no doubt get injured and die at sea. But this situation is a result of human choices and human culture. So I am publishing the picture so it can be seen by human eyes. ← Kayla Next Up For Pregnancy? thank you, i agree with you 100% . I can’t wait for a day when any of this places will begin shut down, then we would say the world is starting to get civilized. There is no limit to the exploitation and abuse of animals in this world and that has reached a critical point where we must say IT HAS TO STOP . But it all depends on how can we inform people that something is wrong? The answer is this: By you writing this article and having the courage to show this . So thank you. keep the good job up and hope more and more people will do the same. There was a dolphin called Bubbles in the the Gasser families travelling circus that had to have a pectoral flipper amputated after catching a serious pseudomonas infection that caused the fin to rot and Gangrene set in. She recovered and performed in shows again but died a few months later after developing Hepatitis. Does anyone know if there is a photo of Winston / Ramu’s amputated dorsal fin?. I’ve never seen one so I assume he died soon after it was removed, right? if we as humans did not subject the poor animals to captivity in the first place this article would not even have been written, we are a barbaric race. Sorry to post in here but i dont know how to contact you we are a group eager to follow up the conditions of an orca held at mundo marino in argentina. Nobody knows anything about the actual conditions of this orca kshamenk. If you look for a video named kshamenk una dia de su vida you will see the poor condition he was living in. We contacted humane society which at a certain point was following the case but they give us the contact of an activist in argentina which so far never replied. Nobody knows anything about kshamenk . Can you help us? Do you ahve any more info on how Tilikum is currently doing? I know you make mention of it in the very end of this article but anymore details (or maybe current pics) would be great. Thanks! I am afraid I don’t have any recent information about how Tilikum is doing. But I expect I would have heard something if he was not doing well.